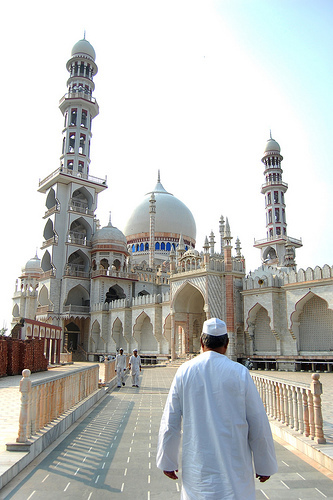 In February 2008, the head Deobandi school issued a fatwa--supported by 6,000 members--in India against violence in the name of religion. The conservative Muslim Deobandi sect leadership and ideals have influenced the Taliban. This Fatwa was issued on the letter head of Darul Uloom Deoband. (Signed and sealed by the Grand Mufti and his three Assistants in the Fatwa Department of Darul Uloom Deoband). In the name of Allah, most gracious and most merciful. Answer (with the blessings of Allah): Islam is a religion of Peace and Harmony. In Islam, creating social discord or disorder, breach of peace, rioting, bloodshed, pillage or plunder and killing of innocent persons anywhere in the world are ALL considered most inhuman crimes. There are several verses in the Quran that strictly prohibit the breach of peace. “Do not spread discord on Earth after it has been set in order” (Surah Aaraf, V. 56); “When he (the mischief-maker) turns his back, his aim is to spread mischief everywhere on earth, to destroy crops and cattle but Allah loveth not mischief.” (Surah AlBaqarah V. 205); “And do not spread discord on the (face of the) earth” (Surah alBaqarah V. 60). The extent of Islam’s emphasis on peace can be seen from the fact that even while granting the right of self-defense to the oppressed, it insists that no excess be committed in retribution and strictly forbids the targeting of any innocent person. Thus, Allah Almighty says, “Fight in the cause of Allah those who fight you but do not transgress limits; for Allah loveth not transgressors”. That is why the Prophet (PUBH) insisted that even during a war, human rights must be fully respected. Several examples of such teaching are to be found in the Prophet’s traditions. Besides, Islam teaches is that all the creatures of Allah are like one family and whoever treats this family of Allah with compassion and mercy would be loved the most by Allah (Baihaqi). Our Prophet Mohammad (PUBH) has said that Allah takes mercy upon those who take mercy upon fellow human beings. You treat the inhabitants of earth with compassion and the inhabitant of Heaven (Allah) shall show compassion towards you (Tirmizi, Abu Dawood). In short, Islam rejects all kinds of unwarranted violence, breach of peace, bloodshed, killing and plunder and does not allow it in any form. It is a basic principle of Islam that you assist each other in the pursuit of good and righteous causes and NOT TO COOPERATE with ANYONE for committing sin or oppression. Allah Almighty says: “Help ye one another in righteousness and piety but help ye not one another sin and rancour.” It is evident from the clear guidelines given in the Holy Quran that the allegation of terrorism against a religion like Islam which enjoins world peace is nothing but a lie. In fact, Islam was born to wipe out all kinds of terrorism and to spread the message of global peace. Allah knows the best.